Everyone is drawn to a good story, yet many are unfamiliar with the story that we actually live in! 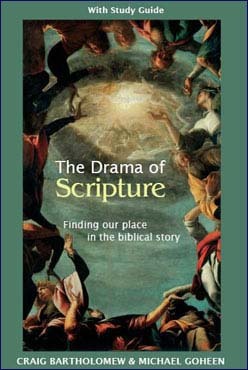 The Bible tells the true story of redemption, and authors Craig Bartholomew and Michael Goheen have attempted to bring a wider attention to this in their book The Drama of Scripture. I am reviewing the UK adaptation, which has been streamlined to better serve as a study tool for churches. Changes include reduced content, removal of most footnotes, and new sections with contemporary significance. I have no familiarity with the US version so it will not factor into my review. For what it attempts – tracing the Biblical storyline and finding our place within it – this book largely succeeds. The authors are very competent at clearly summarizing larger sections and themes of Scripture; it’s impressive to find the Biblical story condensed to 167 pages! Secondly, the reader is constantly presented with practical implications drawn from the text, along with probing discussion questions at the end of each chapter. The authors are clearly passionate about showing the relevance of the Scripture today. The drama of redemptive history is helpfully presented in six major ‘acts’ with an interlude. This is a helpful teaching tool to keep the reader aware of which point in the story they have reached. The standard “Creation, Fall, Redemption, Restoration” formula has been tweaked with the addition of ‘Israel’, an interlude, and a ‘Church’ section; each is welcome and adds balance. By trying to trace the Biblical storyline in a small introductory book, things must be left out. This is unavoidable so grace and understanding must be shown to any who take on such a task. Unfortunately, several important themes were not given the attention I believe they ought, and in some cases were neglected entirely. I’ll split my concerns into three areas: odd statements, misplaced emphasis, and theological issues. For an introductory book to the Bible, there are a few odd statements. The authors claim that we shouldn’t follow the Old Testament laws in punishing idolatry be by death today (p47), but earlier it’s stated that, “the whole of Israel’s experience, including family life, law […] reflect God’s character and God’s original creational intention for human life” (p44, emphasis mine). This unqualified statement is odd enough, but especially when it appears to be contradicted a few pages later! I noticed two mistakes. 1) Samson was identified as the last judge (p62) but Eli and Samuel were also judges (1 Sam 4:18, 7:6). 2). Cain’s descendant Lamech seems to be identified as Noah’s father (p32), but the two Lamechs are not the same (Gen 4; 5:28-29). I expect with Samson, they meant to say that he was the last judge in the book of Judges, but for an introductory book, this is an unfortunate lack of clarity at best. Here are a few areas where I see misplaced emphases. The seriousness of these depends on how one sees their significance. Environmental implications in Genesis 1-2 are given more space than the relationship between Adam and Eve, and the differences in their roles are unexplored. Jesus is correctly identified as the promised seed in Genesis 3:15, but unfortunately OT Messianic expectations are not emphasised throughout. Israel’s (very emphasized) role as light to the nations is all well and good, but it ought to be seen that in the context of their failure the coming Messiah (the true “light of the world”) is such good news and a significant motive for pursuing national purity. The authors give two true stories of “kingdom people” that pursue God’s mission for the world. In both stories, those involved left behind a passion for ‘traditional’ missions in favour of something more socially oriented. By trying to make a point, the balance is swung too far away from traditional missionary work. It’s good to see all work as for God and not have a simplistic view of our mission, but our mission is not purely attractional: we have a Saviour to proclaim. There was a lack of acknowledgement that the world will not always welcome God’s people and their good works, at times we must oppose our culture and suffer persecution. I couldn’t find God’s personal wrath against sin addressed, despite the many opportunities to make this clear in places such as Genesis 3, the Passover event (42-43) where even Israel needed to be protected from God’s wrath, and Christ’s work of atonement. Perhaps the treating of the atonement is the most serious issue. Christ’s ‘victory’ over sin and evil is consistently emphasised above all other pictures. While the victory motif is correct, how Jesus’ death achieves this victory (through receiving our wrath as a penal substitute) is never explained, except for a passing comment about Jesus receiving God’s ‘judgment on a creation that has become corrupted and polluted by sin’ (126), but more explanation of what this means would have been welcome. The section listing aspects of Paul’s theology (144-150) misses any mention of justification. It appears that the authors follow in the New Perspective on Paul with this issue and that will be a problem for some. The authors appeal for unity on eschatology and see too much division on this issue (165), but seem to show their amillennial cards in their treatment of Revelation. Premillennialists will notice the millennial reign of Christ is missing, and dispensationalists will be left wondering why God’s promises to Israel are left unfulfilled. Laying my concerns aside for a minute, Bartholomew and Goheen should be commended for seeking to put the Bible together as a unified whole. Too many in the church today only read the Bible piecemeal for a ‘daily word’, or neglect whole sections of the Bible or the Biblical storyline itself. For such a difficult task, the authors do a very good job. Do I recommend this book? If it weren’t for my concerns above, this would be a great book for those looking for an introduction to the Biblical storyline. Since The Drama of Scripture is intended as for churches to use in small groups and the like, personally I would look for elsewhere for a similar resource. Of course, what is emphasized and what is left out to some degree reflects the theological viewpoints the authors, and the same applies to my criticism. Some will not be worried by my concerns, and if that is the case, I would certainly recommend this book to them.